June (8 months) helping me make pear puree. There have been so many things that have surprised me about myself since becoming a mom. One of those things is how much I’ve enjoyed making the kids’ baby food. I’m no health nut by any means, but it’s nice to know exactly what’s going in their little bodies. Not to mention, it saves a lot of money in pre packaged baby food- and it’s super easy. 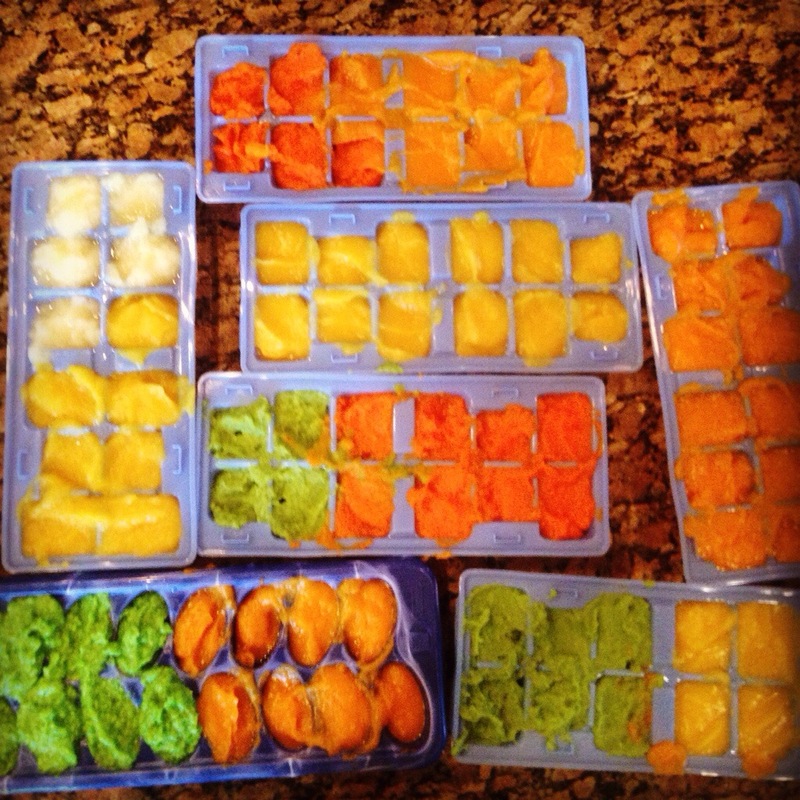 I freeze all my baby food in ice cube trays & keep it anywhere from 1-3 months. I highly recommend a website called www.wholesomebabyfood.com. I have used this site a TON over the last five years and it continues to be an amazing resource. There’s info on how to prepare food, allergies, age appropriate food charts by month (when to introduce what)… and honestly any question I’ve ever had about food for my littles has pretty much been answered on this website. I like to do a ton at once as you can see. 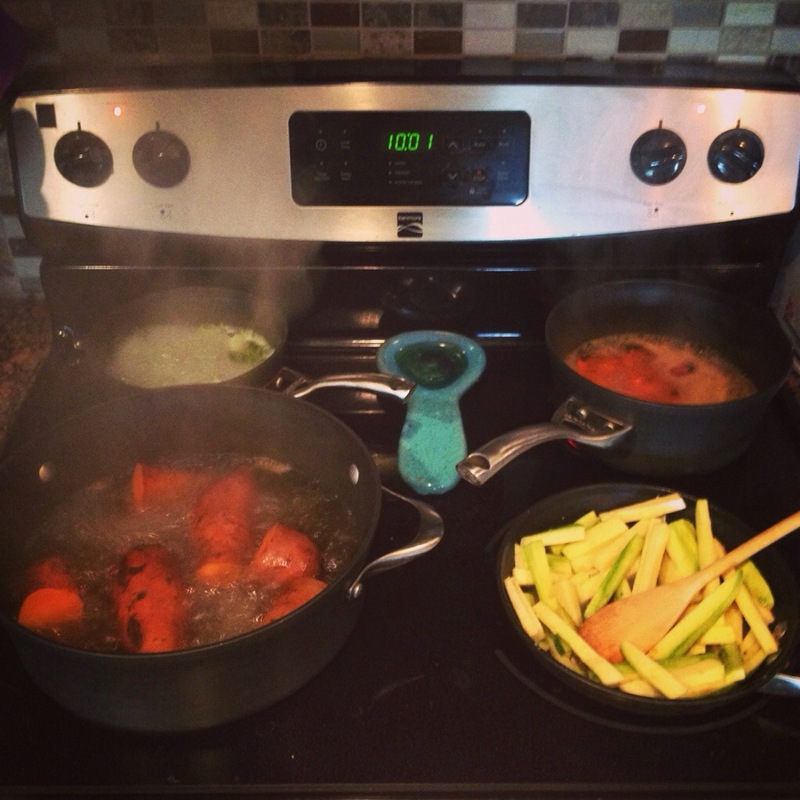 This morning, I did pears, broccoli, carrots, sweet potatoes, zucchini, acorn squash & peas. (The broccoli & peas were frozen- another way to save a bit). All in all, it only took a couple hours & I have tons of food now in my freezer! 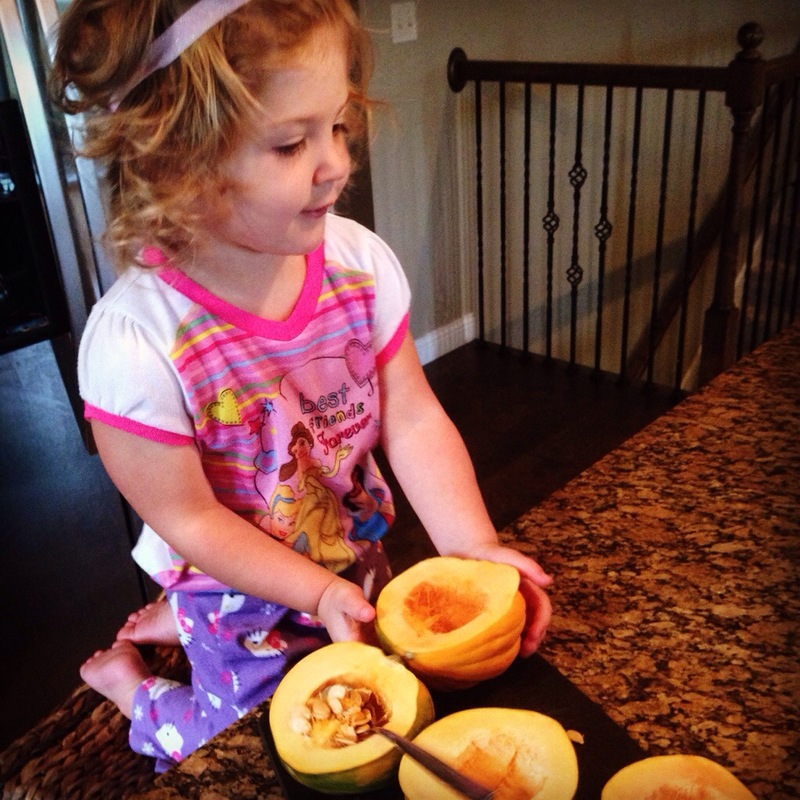 Pearl helping me with the acorn squash. If you have older kids & can’t think of how you’d have time to do something like this, let them help!! Above, Pearl is helping me take the seeds out of these acorn squashes. Then we poured a little olive oil & salt on them and roasted them for a mid morning snack. At times it’s overwhelming having so many littles at home, but they LOVE being involved and helping in the kitchen any chance they get!! I like to do it all at once, make a big mess and be done for a while. If you’re thinking about trying your hand at making your own baby food, don’t be intimidated- if I can do it, you can do it! good luck & enjoy! 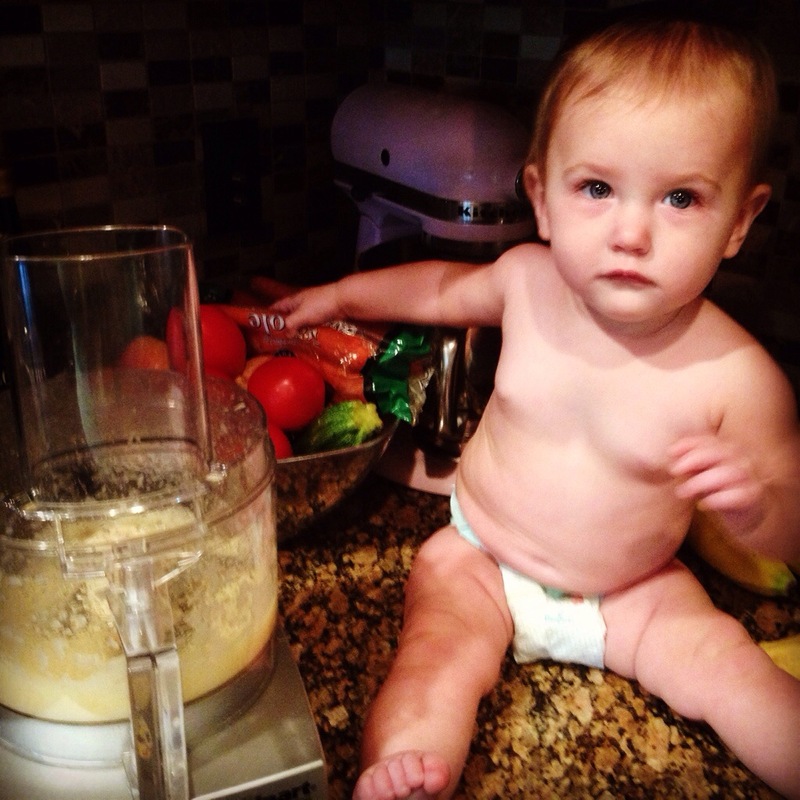 What motivates or intimates you about making your own baby food? ← Service is Not my Forte. Hi Eliz! I was intimidated at first to make my own baby food because I found the whole introduction to solids a little overwhelming and wasn’t sure about texture, what foods she would like, etc. Thanks to your encouragement I started making my own baby food this past week. I love the wholesome babyfood site you recommended. I also have found the book “Super Baby Food” by Ruth Yaron really helpful – she has a whole section dedicated to ways to prepare pretty much any type of food for your baby. I am loving your blog!